All Day Locksmiths can provide commercial & residential access control systems. It is one of the most effective ways to control who can and can't enter a building. Security access control systems can do more than just control who can and cannot enter a building. You can also see when they entered or exited, observing movement of all employees and visitors, including restricting entry during specific times. 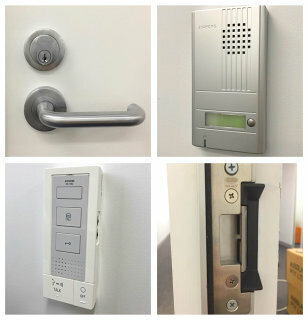 Door access control systems can also be used to secure a specific area or sector of a building. This is especially useful to protect assets and confidential information that may require additional security. Allowing the free flow of entry into a building or area is possible through a number of methods. Customers can choose from a range of access control systems, including proximity readers, swipe cards, and pin codes on access control keypads. They can also be integrated with other security systems for additional security and protection. Connect an access control system with time and attendance records or a CCTV system. 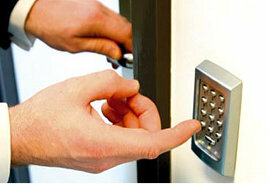 Electronic access control systems also eliminate the need for keys. Relying on the need for old fashioned key and lock systems increases the risks and costs associated with lost keys. With access control systems, you don't have to worry about the additional cost of changing locks if keys are lost. If a swipe card is being used, the card can be cancelled immediately at no significant expense. An Access control systems allows and provides those authorized individual’s safe and secure access in and just as importantly OUT of selected doors of your business premises at the same time excludes the unauthorized people out. With an Access control system in place there is no for keys, the need to replace lost or stolen keys, or chase older keys from people who are no longer employed. The business owner knows who has access to particular areas.